Don’t let your calendar fool you, despite the fact that it’s August; there is still some summer left! If you were looking for reasons to hop on the ferry and get out for some sunshine and fun, look no further. We’re highlighting a few specific Island Hotspots, figuratively and literally, to take advantage of.Most of these are geared toward daytime activities, so if you are looking for some nighttime hotspots – check out our previous blog about island nightlife! Of course our first hotspot has to be a beach! Located at the site of, you guessed it, an old mansion – this one might be the best-kept secret for tourists. Mansion is a great place to kick back, relax, and catch some sunrays. The sand is some of the best for walking, the waves are some of the best for riding, and the surrounding rocks make for great adventure. And while the surf is still great and the views are still incredible, it tends to be a little less crowded and makes for a great place to spend time with family. So, make sure to stop by here on your next visit to the island, but if anyone asks, you didn’t hear the secret from us! 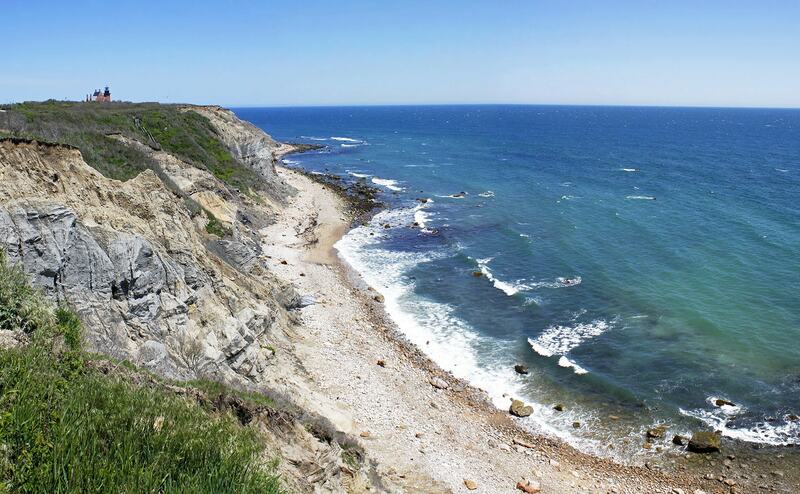 In case you didn’t know, hiking is big on Block Island! With approximately 25 miles of trails across the Island, you could understand why it’s pretty popular. Of all of those great trails, Rodman’s Hollow is a natural hotspot for daytime strolls. The views of the island, from the path, are some of the most beautiful around. The Block Island Conservancy has worked over the years to protect much of the lush landscape and creatures that call it home. The many visitors like to take their time and keep their eyes peeled for rare birds and glass float treasures. The Bluffs may be THE must-see view on the Island, which is exactly what makes it a hotspot. You may find groups of people there on the weekends, in the summer. Everybody who takes the time to stop by raves about the beautiful look out point at the top. For the full experience though, visitors can climb down the 140-plus stairs to the beach at the bottom. On a day when the water is fairly calm, you can find people sunbathing on the rocks below or taking pictures of the breathtaking coast. Scattered about are also gorgeously stacked rock towers for visitors to marvel. Take a bike or a walk to check out this serene hotspot. Gain some environmental knowledge about the island and also get the cool experience of kayaking? That sounds like a double deal! The folks at Pond and Beyond specialize in both of those things and have you covered with their Eco Tours. As locals, they are insightful about historical elements, wildlife, and general island facts. Then, there is the kayaking! Whether you’re a beginner or know your way around a body of water in a paddleboat – you’ll have a great time traversing Great Salt Pond. The tour is a great hotspot for families to get a little adventure in together. Try to book ahead of time, as spots fill up fast! The two pillars of Block Island! You can always find visitors making their way to either of these historic beauties. The North Lighthouse is a bit of a hike along the beach (you can bike or drive to the parking lot to start) but this hotspot is well worth the effort. The lighthouse is also one of the premiere places on the island to watch a sunrise or sunset. The Southeast Lighthouse is actually right along Mohegan Bluff – so you may even take some time to double up. Like its Northern counterpart, visitors are treated to spectacular views and rich history. If you decided to take the tour, make sure to ask about how the lighthouse was relocated. Those are five of our suggestions for places to visit and meet great people on the Island! We’ll even float you a bonus hotspot location: right there on the ferry ride over! Feel free to let us know some of your favorite places to hangout and have fun. That is, if you are willing to share them!